It’s natural to have a lot of questions when health problems disrupt your life and leave you unable to work. Where will money for your basic expenses come from? What will your future look like? Income from Social Security Disability benefits can ease your worries. But the disability system is complicated—and leaves you with even more questions. Think of this page as a resource just for you, created by the law firm of the Schneider Law Firm. We’re your hometown disability attorneys with offices in Fargo and Grand Forks. Our mission is to help people in North Dakota and northwest Minnesota get through tough times brought on by serious medical conditions. Keep reading for answers to some of the most common questions we hear from our clients about applying for Social Security Disability benefits. And for answers about particular situation, we’ll provide an evaluation of your case for free. To qualify for Social Security Disability benefits, you must have health problems serious enough to prevent you from doing any kind of work for at least a year. For one type of benefit—Social Security Disability Insurance (SSDI)—you also must have a record of substantial recent work and payments into the Social Security system. For another form of benefit—Supplemental Security Income (SSI)—you don’t need significant work history but must show that you have limited income and assets. How does my age affect my chances of getting Social Security Disability benefits? Your age can make a difference in your disability claim. One of the key qualifications for disability benefits is that you can’t work in your most recent job, or any other job. When you’re over 50, Social Security considers you less likely to be able to adapt to a different line of work, therefore you’re more likely to have a qualifying disability and receive benefits. What information will my attorney need for my disability claim? To get started on your disability claim or appeal, you’ll need to tell your lawyer details about your medical conditions, how your health prevents you from working, when you last were able to work, what past jobs you held and what kinds of medical treatment you’ve received. The attorneys at the Schneider Law Firm will also ask you questions you might not have thought about—to discover what Social Security will want to hear about your claim. Tell Us About Your Case Now! It can take several months to get an initial decision from Social Security about your disability claim. If you’re denied, it can take more than a year to resolve your case. An important step in appealing your denial—talking to a Social Security administrative law judge—comes with a long wait. On average, it can take anywhere from 12-16 months before you are in front of an administrative law judge. How much money will I receive from Social Security Disability benefits? For Social Security Disability Insurance, your monthly checks are based on your work and salary history but subject to limits set by the government. In mid-2018 the average payment from the program was $1,198 per month. The maximum allowed amount was $2,788 per month. For Supplemental Security Income, the government applies a standard amount to everyone, which changes each year. It was set at $771 per month for an individual in 2019 and $1,157 for a couple. Can I get health insurance with Social Security Disability benefits? Yes. When you can’t work because of bad health, you need health care coverage more than ever. But if you’ve lost or left your job, you can’t get coverage through work. Social Security recognizes this riddle and offers eligibility for government-run health care when you qualify for disability benefits. With Social Security Disability Insurance, you qualify for Medicare health coverage after a two-year waiting period. That seems like a long time, but you can get credit for the time you spend waiting for approval of disability benefits, so by the time you receive benefits the remaining wait may be much shorter. With Supplemental Security Income, you qualify for Medicaid health care coverage as soon as you qualify for disability benefits. Social Security Disability Insurance (SSDI) is an insurance program that you paid into when you worked. Your eligibility for it depends on your time working and contributing to the system through deductions from your paychecks. The benefit checks you receive vary depending on what your income was. It also comes with eligibility for Medicare health coverage after a waiting period. Supplemental Security Income (SSI) is for people with low incomes and resources who haven’t paid in substantially to Social Security. It provides benefits to adults and children with disabilities. The checks are based on an amount set by the government. Qualifying for SSI also qualifies you for Medicaid health coverage immediately. Why is Social Security denying my claim after my doctor said I have a disability? Social Security has a strict, very specific, definition of what makes a “disability.” That could differ from your doctor’s opinion. Sometimes doctors don’t describe your symptoms in a way that matches the criteria of the Social Security Administration (SSA). A disability lawyer can help with this by helping you gather the kinds of medical reports that Social Security is looking for. What should I do if I was denied Social Security Disability benefits? When you were counting on disability income to survive, it can feel devastating to get denied by Social Security Disability. But this isn’t the end of your case. In fact, most people are denied at first. Your next step is to appeal the decision. Reconsideration: Asking Social Security to have someone different review your case again. Hearing: Meeting with a Social Security administrative law judge to make your case for benefits. Appeals Council review: Asking a Social Security group called the Appeals Council to review the judge’s decision. Federal court: Filing a lawsuit in federal court disputing Social Security’s decisions in your claim so far. Having a disability lawyer who understand the process can make a big difference for you when you are appealing a Social Security Disability denial. What will happen at my disability hearing? Going to see a disability judge can be the most important moment in your claim. It might be your only chance to explain why you need benefits face to face with an important decision-maker at Social Security. This is the step where many people who’ve been denied finally win benefits. The hearing is informal compared to many court procedings. It’s private. Besides you and the judge, just a few other people are likely to be in the room. The judge will ask questions about your health problems and inability to work. A vocational expert may testify about whether there are any jobs available for you. A medical expert may testify about the severity level of your health problems. Your lawyer will present your argument for benefits, question the experts and answer legal questions from the judge. 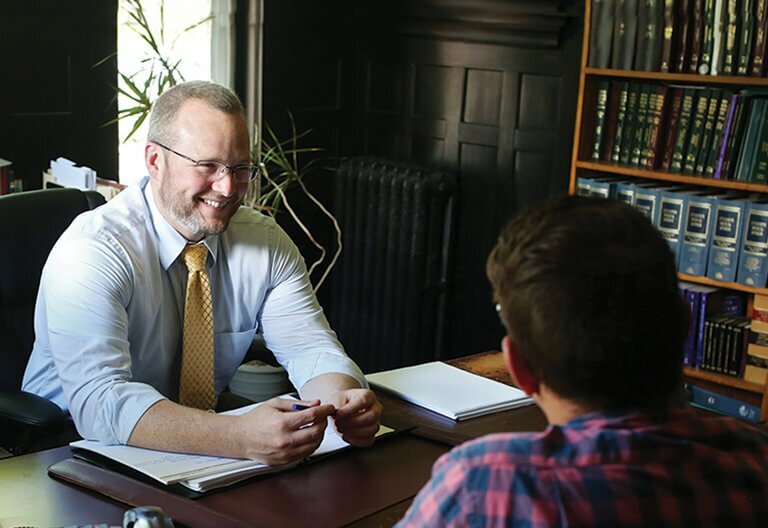 People get nervous before their hearings with judges, but the attorneys at the Schneider Law Firm take time to get you prepared and confident and guide you through the process. Do I need a lawyer to help me with my disability claim? We recommend working with a lawyer when you need to apply for Social Security Disability benefits or appeal a denial. And we’re not just saying that because we’re lawyers. Applying for benefits is complicated and labor-intensive. Appealing is even more complicated. You’re dealing with health problems already. A lawyer can take the burden off you, so you can focus on your health. On top of that, your chances of winning benefits can improve with a lawyer. A study from the U.S. Government Accountability Office released in 2018 found that people with representatives were almost three times more likely to be awarded benefits after their hearings with disability judges. What does it cost to get a Social Security Disability attorney? Money is tight for you right now, and the Social Security system and disability lawyers understand that. For that reason, you don’t pay any attorney fee until you win benefits. And nothing comes out of your pocket up front. When you win benefits, your attorney gets paid 25% of the back benefits you’ll be awarded for the time you spent waiting on approval, up to a limit set by Social Security. At the Schneider Law Firm, we’ll also start off by evaluating your claim for free. What are the biggest mistakes people make when applying for Social Security Disability benefits? Delaying. If you wait too long to file for benefits, you may miss out on benefits you could’ve been receiving. If you miss deadlines when you’re appealing, you risk getting denied. Sloppy Application Forms. Errors or incomplete information on your application could lead to a denial later on. Lacking Medical Evidence. Get regular medical attention and write down every doctor visit, all expenses related to your health problems and everyday limitations you experience because of your health. Medical records are crucial to your claim, so you need to be able to show a strong history of doctor visits. Failing to Appeal. If you’re denied, and you miss the deadline to appeal, you also miss a possibly better opportunity to win benefits. Most people are denied when they first apply. It’s often during appeals when people finally are awarded the benefits they need. Not Working with a Lawyer: The Social Security Disability system is complicated and difficult. It involves thousands of rules. Having an experienced disability lawyer can make the process easier on you and improve your chances of winning benefits. When you need help applying for Social Security Disability benefits, or appealing a denial of benefits, the disability lawyers at the Schneider Law Firm are friendly to you, but forceful about your claim.